Creating a Linkedin Unique URL in 2016! A LinkedIn Unique URL can often have lots of letters and numbers OR you can look professional and progressive by tailoring it to your name. 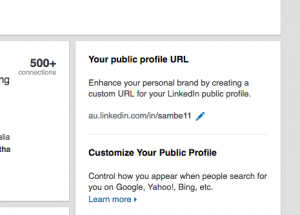 It’ll take 5 minutes to create your Linkedin Unique URL in 2016. Just under your photo, look for the “http:…” and at the right of this is a cog / flower / settings icon – click on it! 2. On the right of the screen you’ll find “Your public profile URL”. Click the pencil to the right of the link. Update it to your full name or a shortened version. In the image below you can see my link has two 1’s as sambell was taken and I’d prefer a shorter link than samanthabell. 3. 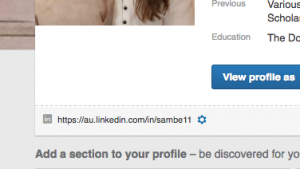 Click ‘save’ and you’ll now see under your photo your fancy new Linkedin Unique URL! Add your new Linkedin Unique URL to your email signature, social media sites, your website and beyond. You’re looking fine, High Flier! If you’d like more ideas to standout on Linkedin, we’ve a whole guide for you and it is full of 20+ successful professionals’ profiles as examples for you to learn from. Put aside 30 minutes – 3 hours (you decide) to go through it and STANDOUT on Linkedin. Imagine feeling so good about how you’re represented on Linkedin – how fabulous would that be!